Bob Irwin, owner of The Gun Store in Las Vegas, considers himself the pioneer of machine gun tourism. Irwin has been renting out machine guns to tourists for shooting at his indoor gun range since the 1980s. "This is my idea," he said. Customers can fire an array of machine guns, including a World War II-era Schmeisser submachine gun, a pink AK-47 with an unofficial "Hello Kitty" decal someone put on it and a belt-fed M249 that's currently used by the U.S. military in Afghanistan. The guns are "for the bachelorette parties to shoot," Irwin explains. Irwin said that he used to be the only range in town where customers could fire machine guns. But five competitors have opened up just in the last year, dragging down his annual sales by 30%. Still, he says he averages about 200 customers a day. One of them is 18-year-old John Kovacs, an Eagle Scout from St. Louis. He said he was there for the rare chance to fire a fully-automatic weapon, and also because he's barred from visiting casinos, where alcohol is served. "Because I'm 18, I'm not allowed to gamble and I'm not allowed to drink, but I am allowed to go to strip clubs and shoot machine guns, so that's why I'm here," said Kovacs. The Gun Store does a brisk business charging customers to shoot Israeli-made Uzis, which were a staple in 1980s action movies, as well as vintage Thompson submachine guns, popularly known as Tommy guns, used by Prohibition gangsters. 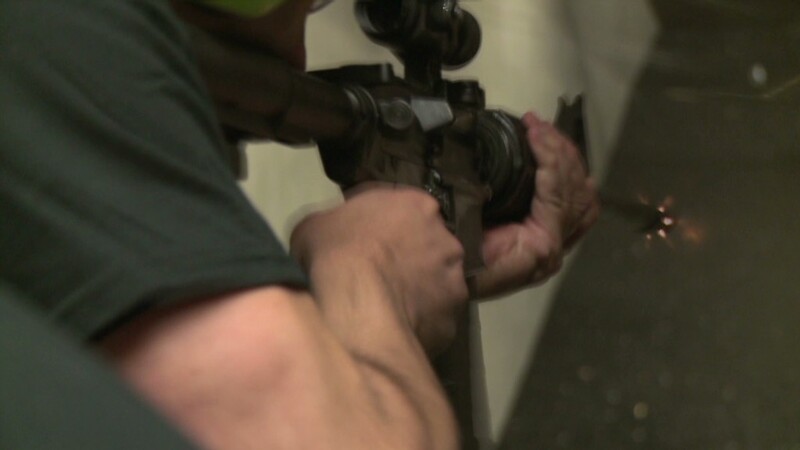 "People want to shoot the guns that they see in the movies," Irwin said. Irwin and his 40-plus employees sell packages, ranging in price from $100 to $1,000, for bachelor parties and even weddings. The range has a wedding chapel, and one of his staffers is an ordained minister. (For more information, see his website ShotgunWeddings.com). Catering is provided by the restaurant next door. The party packages come in different themes, such as World War II, where customers fire vintage weapons, and the zombie apocalypse theme, where customers take aim at paper targets depicting undead clowns. "It's practice for when we have to shoot real zombies, which is apparently coming up sometime soon," said Irwin. The shop also offers lessons for kids 6 years old and up that it advertises as "fun for the whole family," while emphasizing gun safety for children. "The guns exist and children who are not familiar with guns are the ones who will have accidents," said Irwin. Machine guns aren't usually available to civilians. Federal law does permit civilians to own machine guns made before 1986, however some states and cities forbid it. Also, machine guns tend to be prohibitively expensive. When asked who buys these guns Irwin says, "Rich guys. The same guy who buys a Ferrari because he can." Federal law also allows people in the gun industry, such as owners of gun shops and ranges, to own newer machine guns, so long as they're acquired for the initial purpose of demonstrating them to members of law enforcement. The Gun Store memorializes its most famous visitors with signed portraits on the wall, including the cast of the TV show "Sons of Anarchy" and comedian Carrot Top. There are also portraits of important personalities in the world of guns, such as Mikhail Kalashnikov, the recently deceased inventor of the AK-47. Irwin said he met Kalashnikov once, but has mixed feelings about the Russian soldier who served under Stalin. "He was a pioneer in designing ways to kill Americans," he said. "Fine guy, just don't like his politics." Editor's note: The owner of Hello Kitty said it is not affiliated in any way with gun manufacturers and has never authorized the use of its Hello Kitty character or related logos on firearms or other weapons.